Editor-in-Chief Dr. Lucia Galleno, Queens University of Charlotte, USA. Journal of Foreign Languages, Cultures & Civilizations an international peer-reviewed journal published by American Research Institute for Policy Development. The journal aims at publishing the most innovative peer-reviewed articles from the discipline of international studies, as well as original thinking from elsewhere in the social sciences with an international dimension. Interdisciplinary and wide-ranging in scope, the journal provides a forum for discussion on the latest developments in the theory of international relations, welcoming innovative and critical approaches. 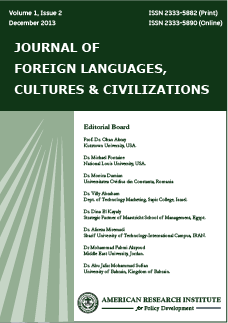 Journal of Foreign Languages, Cultures & Civilizations seeks to acquaint a broad audience of readers with the best work being done in the variety of intellectual traditions included under the rubric of international studies. Therefore, the editors welcome all submissions addressing this community's theoretical, empirical, and normative concerns. First preference will continue to be given to articles that address and contribute to important disciplinary and interdisciplinary questions and controversies. Each paper published in Journal of Foreign Languages, Cultures & Civilizations is assigned a DOI®number, which appears beneath the author's affiliation in the published paper. Click HERE to know what is DOI (Digital Object Identifier)? Click HERE to retrieve Digital Object Identifiers (DOIs) for journal articles, books, and chapters. CrossRef, CrossCheck, Cabell's, Ulrich's, Linguistics Abstracts Online (LAbO), Griffith Research Online, Google Scholar, Education.edu, Informatics, The LINGUISTIC List, Universe Digital Library, Standard Periodical Directory, Gale, Open J-Gate, EBSCO, Journal Seek, DRJI, ProQuest, BASE, InfoBase Index, OCLC, IBSS, Academic Journal Databases, Scientific Index. Lucia Galleno, Ph.D.,World Languages, Queens University of Charlotte, USA. Dr. Michael Gesin, Dept. of History and Political Science, Worcester State University, USA. Dr. Eric Nay, School of Interdisciplinary Studies, OCAD University, Canada. Prof. Sara Núñez de Prado Clavell, Universidad Rey Juan Carlos, Spain. Dr. Oliviero Frattolillo, Department of Asia, Africa, and the Mediterranean; University of Napoli ‘L’Orientale’ (Naples, Italy). Dr. Mark Brooke, Centre for English Language Communication, National University of Singapore. Dr. Patrice Larroque, Département des Etudes Anglophones, Université Paul Valéry, France. Prof. Peter M. Matu, Dept. of Languages & Communication Studies, Technical University of Kenya. Dr. Sandhya Rao Mehta, Prof. of English, Sultan Qaboos University, Oman. Dr. Nafez A. Shammas, Department of English, University of Petra, Jordan. Dr. Mashael Al-Sudeary, Associate Professor of English, Princess Nora University, Saudi Arabia. Dr. Cristina-Georgiana Voicu, Department of Communication, Apollonia University of Iasi, Romania.